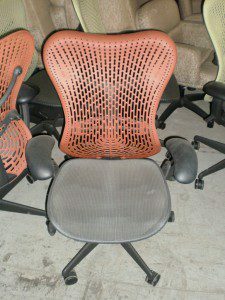 The best place to look for used office chairs in Pittsburgh is Integrity Wholesale Furniture! Here at Integrity Wholesale Furniture, we cater to the desire of businesses just like you who want to make their money go further as well as be more environmentally conscious by purchasing used office furniture that is still in great condition. We have countless variations of office furniture in our warehouses, all of which is in exceptional as-is condition and ready to ship! We have a wide range of services like office liquidation solutions to support the standing quality of our used office products as well. In all likelihood, some of your own neighbors are already taking advantage of the low prices that come with used office furniture from Integrity Wholesale. With a variety like we have, it’s not hard to find what you want for the right price. We have tons of great seating products including the Herman Miller Caper office chair. Yet another best-selling Herman Miller design we currently have in stock is the Herman Miller Mirra office chair. The Herman Miller Caper chair is really wonderful for office spaces that are low on space. Being the last word on versatility, they make great desk chairs or side chairs, and if you need your space for different things, they stack for maximum space conservation. We have tons of colors in this range, so you can have your pick of whatever looks best for you! The polymer backing has a myriad of holes to ensure a high level of ventilation, which helps keep long meetings or logging lots of hours at the desk as comfortable as possible. The Mirra is, likewise, a wonderful option. While this is a fully functioning swiveling chair, it is easy to see that measures were taken in the design to prevent it from having that “bulky” feel, which many office chairs have. You can also clearly see the how this chair is yet another example of how Herman Miller’s designers kept the idea of airflow in the back of their mind while they were designing this fine chair. Hopefully, this post has given you a clear picture of some of the ways that Integrity Wholesale can deliver you the best quality used office furniture on the market. Our customers keep coming back for years, because they know we are looking out for them. Here at Integrity Wholesale, we strive to give hard working businesses like yourself the option of excellent quality used chairs, cubicles, desks, and other exceptional furniture, all at a fraction of the cost. No Comments on "Best deals on used Herman Miller chairs in Pittsburgh!"